Now you can enjoy hundreds of mouthwatering, tried & proven recipes from the past 2014 of Taste of Home-plus bonus recipes-all together in one, gorgeously photographed, hardbound cookbook. More than a variety of 500+ Family Favorites in All! There are appetizers, main dishes, sides, soups, salads, desserts and more. There is also special chapters for quick fixes, mom's best meals, weeknight solutions, holiday celebrations, cooking lighter, potluck pleasers and more! Every recipe is a proven dish from a real home-cook person. Plus they're all made with easy, everyday ingredients and with simple, step-by-step instructions...including prep and cook times. 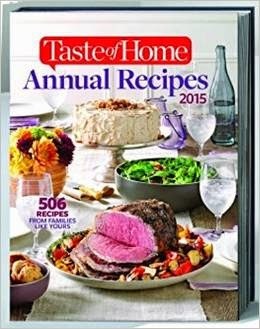 Inside 2015 Taste of Home Annual Recipes you'll find: * 500+ family-favorite recipes from Taste of Home magazine, * Huge variety: Main dishes, side dishes, appetizers, desserts & more! * 350+ gorgeous color photos, * Prep & cook times for every recipe. Buy the book HERE.